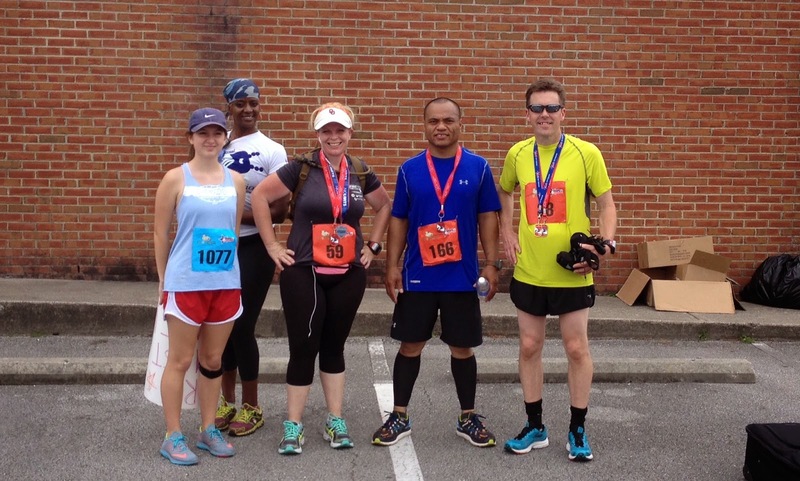 With the great support and help of the Another Mother Runner Nuun No Limits Half Marathon Challenge I trained for my second half marathon this spring. It wasn’t always easy. 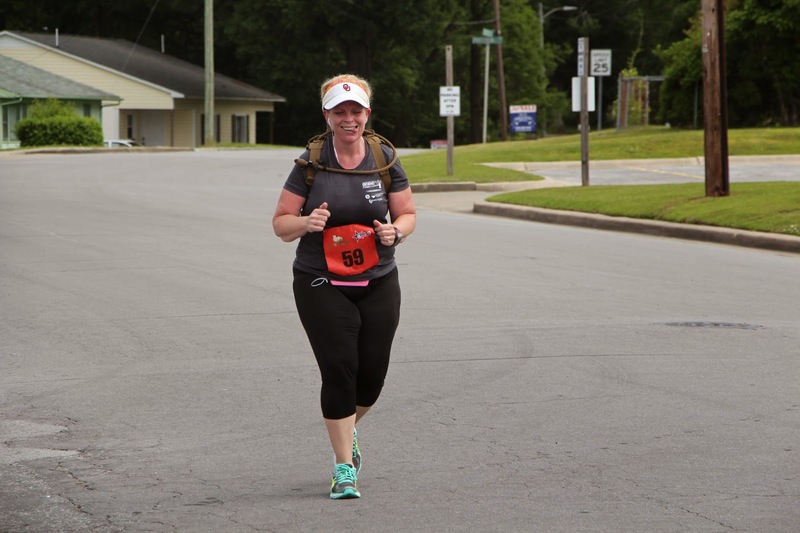 Due to some personal stress I almost quit the training and gave up on the race a few times, but I decided that is what pushing past limits is all about. This time quitting was not an option. And I’m so glad I didn’t quit. This race had me super nervous the night before, but come race morning I was excited. It was a beautiful day to race and I met my goals for the race. I finished strong, only walking through the three aid stations, I wasn’t last and I made the time I expected I would finish at. 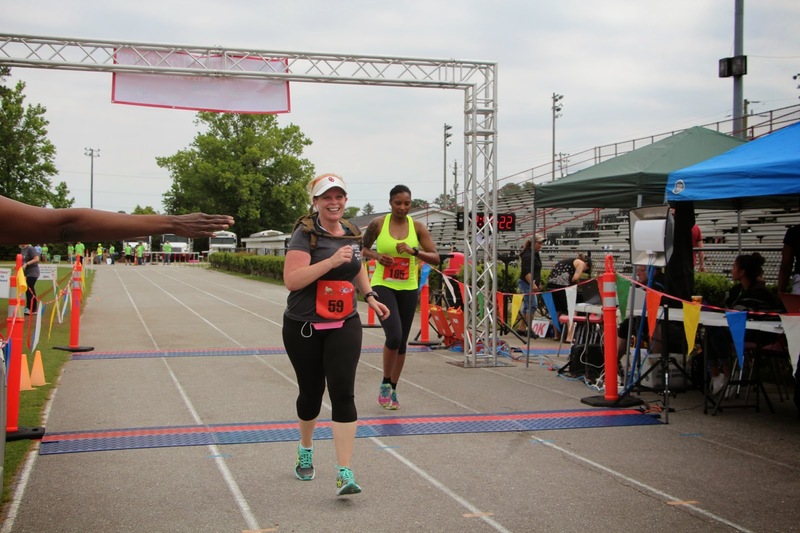 It was a great day to race and finishing it meant so much more than running 13.1 miles — it meant pushing through stress and finishing something I started no matter what was going on around me. 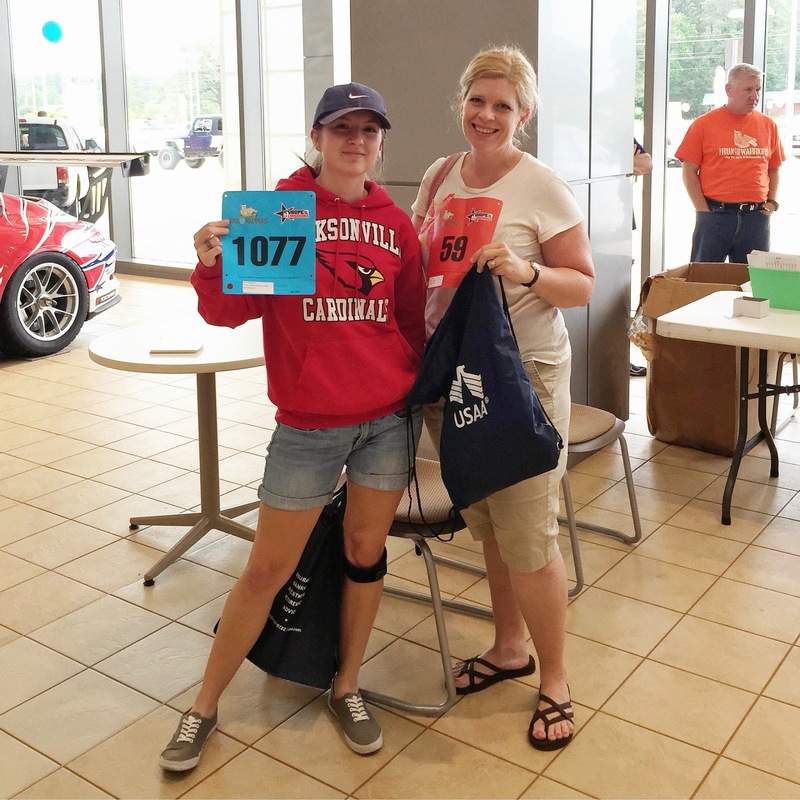 Packet Pickup the evening before race day. As I wrote earlier I was a nervous wreck the night before my race. 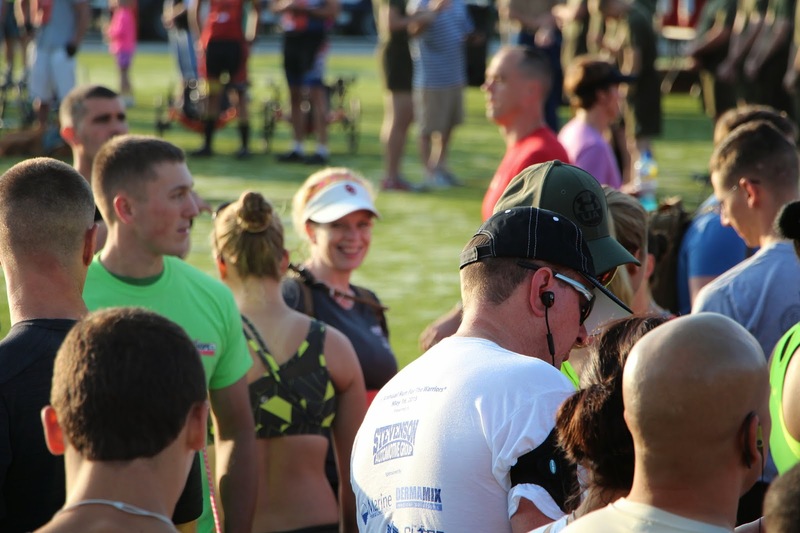 I had finally come to a point where I felt I could enjoy my race ahead and own the fact that I had pushed through some very tough stress to get to the starting line, but none of that mattered much the night before. It was almost comical how nervous I was. I had a baby shower to attend and I kept telling two “healthy” friends how my biggest fears about this race were (A) I was going to be last and (B) I wasn’t going to pass people like I usually do because I was so slow this time. It was awful!! When I got home I got everything ready and then couldn’t sleep. Very normal, but my first half I think I was so excited to be doing it and I had a friend visiting to run with me that I didn’t mind not being able to sleep. This time I just laid there and when my husband came to bed at about 11:00 pm I whispered, “I can’t sleep.” He encouraged me to get some rest, because I had to get up at 5:30. Apparently I went to sleep because then my alarm went off, I dressed and went downstairs to get my coffee down me early enough for it to pass and help me go pee before the race start. The race start that I had sworn was 8:00 am, but seen in my email the night before was “7:00 am ceremony and race begin directly after the ceremony..”, so now I needed to pee by about 6:45 at the latest. My family was gracious enough to all get up on time and support me for this race. 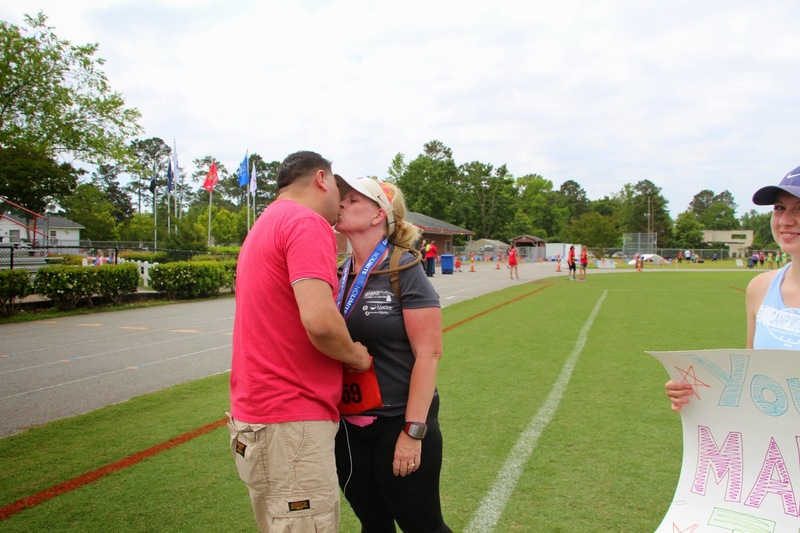 My husband was deployed for my first half marathon, so it meant a lot he come this time. (In fact, I think if they don’t support me from now on out I’d be okay…but don’t put that in stone just yet.) I didn’t make my son come to the first half either, but this time I asked my family for Mother’s Day if they would make signs and show up at least once along the course to cheer me on. They were kind enough to comply and we went off to the race, one daughter assuming photographer duties while the other ran the 10K run of this race. 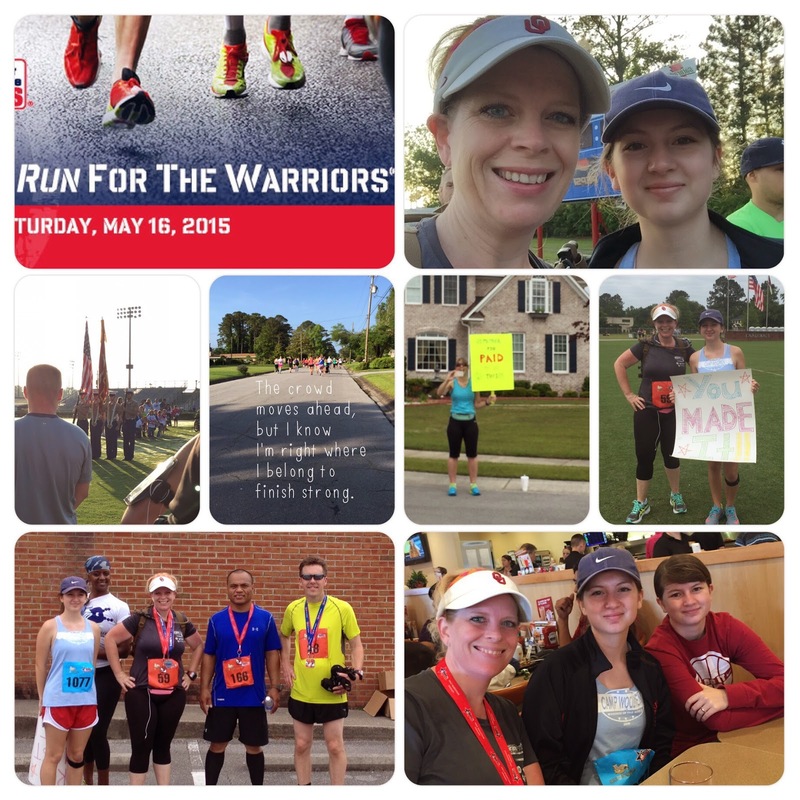 This race was the 10th Annual Run for the Warriors race and it’s run about five minutes from my house. We were there in plenty of time for me to pee ‘at the last minute’, but the line was horrible for the porta potties. The lady in front of me began chatting with me and we suddenly realized only 3 of the maybe 8 potties were opened. Oh geez. This year they were announcing for everyone to be in their race corral prior to the ceremony that starts off the event, so we were getting nervous as they were counting down the time to the ceremony. The lady said, “Worse thing is we walk into our corral during the national anthem.” Thankfully, that didn’t happen and just in time I was able to empty my bladder and get to my corral before the ceremony. I’m not usually there for the ceremony because it’s usually earlier than the race time, but after seeing the email I knew I had better be there on time. It was very touching. 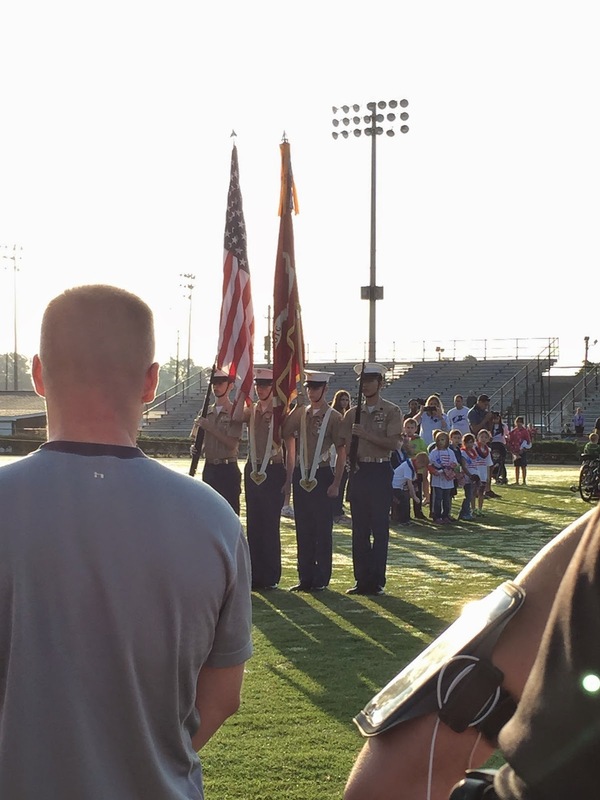 A kindergarten class came and handed out little flags to the wounded warriors who were racing while a patriotic song played and I got all teary eyed waiting in the half marathon corral. There was an veteran of WWII there as well. Hope for the Warriors is a cause I love to support each year with this run and since this will be my last one in this area I was glad I made the ceremony. WHAT?!?!?! The weather was beautiful, but beginning to warm and they had made us all get in our corrals before the ceremony. Um…why??? Who knows. Needless to say that change to the race this year did not earn them points with many runners, but oh well. I was ready, so I stood chatting with my potty-line friend about running — she is a marathoner and was one week out from surgery and hoping not to split a stitch today. oh my. Just chatting while waiting for race to start. I also got in touch with some friends that were running the half marathon, my daughter running the 10K and another friend running the 5K. We encouraged each other, complained about the late start and I asked my daughter how her knee was feeling. 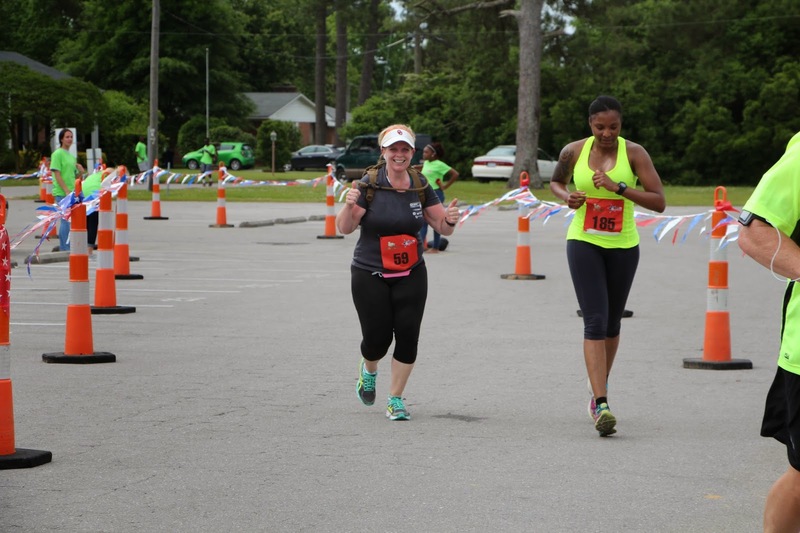 She ended up walking/running the race due to some bad knee pain and I was proud of her for even trying to get it done, but I knew she was really vexed. Finally, race time came and off we went. My family was waiting for me a few hundred feet down the road and my first smile came. About half a mile in my daughter caught up to me (each distance race went out in waves and we ran with the 10k’ers for a bit of time before breaking away). We wished each other a good race and off she went. Right about that point I had already passed a lady or two and knew I wouldn’t be the last one in. For me that was a big deal, although I had resigned myself to being last if that meant someone else didn’t have to be and it would make them happy. However, knowing I would not be absolute last made me smile. I’m used to seeing the crowd surge ahead, so that didn’t bother me too much. I kept tabs on my Garmin to see where my speed was and I knew I was right where I needed to be to finish strong. Suddenly three miles was done. It was a beautiful day out. 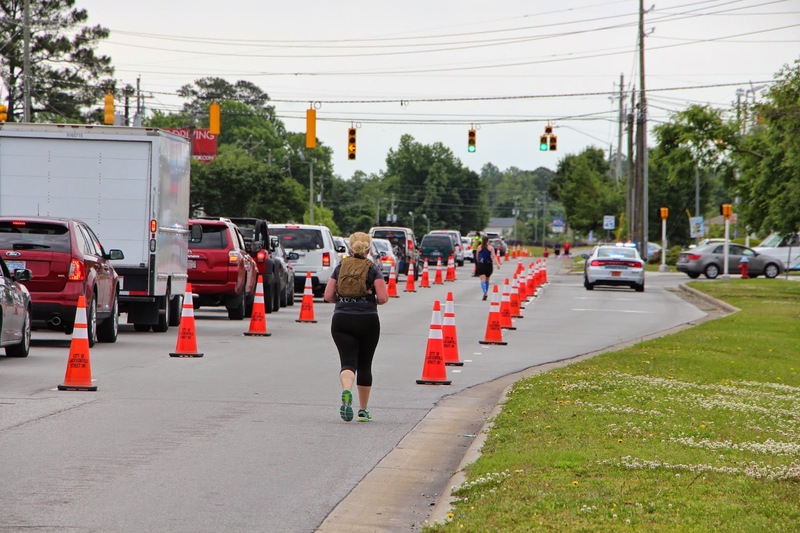 The first half of this race was done in a neighborhood full of trees. There was also a nice breeze blowing, so between that and shade it was glorious! I giggled when I passed a group of people walking the 5K race and a gentleman says to me, “Your’e almost done!” “No..I’ve still got 10 miles to go!”, I cheerfully replied and he still told me good job. By miles 5-6 I started catching up to a couple more people and I ran with a lady who was running her first half marathon. We chatted for about half a mile, sharing how we were late-in-life runners and never dreamed at 20 years old we’d be running half marathons at 39 and 42 years old. I told her to feel free to leave me if she needed to speed up, but she ended up stopping for a walk break and I left her behind. Looks like I’m walking, but I promise that’s a jog. a 12:45 minute mile jog, but a jog none the less. Let me pause to share that I take great pride in running the full distance of a race I sign up for. I know Jeff Galloway promotes the run/walk method for better health during endurance races and I don’t hold it against anyone if that’s the way they choose to race. I’m all for taking care of your body when you complete any kind of athletic event. But for me, when I say I’ve ran a _____ I want to know I actually ran the entire thing. If it means I’m slower then I don’t mind, because I know I ran the full thing. This means I have to train and find the pace I know I can maintain for the duration of a race, and it means starting slower and finishing a tad faster. That’s called a negative split and it always works well for me. It also means I usually start passing people about half way through a race who started out way too fast and can no longer maintain the speed they began with. I seriously thought I was going to be so slow that I wouldn’t pass anybody, so when I began passing people my confidence when through the roof and my smile got bigger. I don’t mean this in a prideful way, but it just makes me so happy that I race well and don’t hit a point where I can’t continue. So, when I passed the three ladies walking at about mile 6-5 and one of them said to me, “Getting inspired to pick it up half way, huh?” I smiled and held back the reply I wanted to share…”No, I haven’t stopped running yet.” They never did pass me again and I took joy in that thought. Though I do understand it could be that one was running with an injury or something, so I don’t want to sound rude. Please understand that. 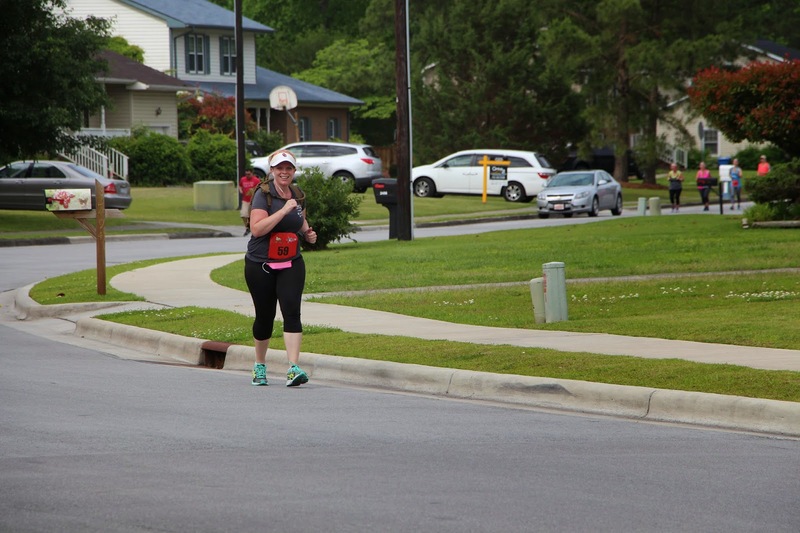 A good friend of mine was cheering people on at about 8.5 miles and she hung around until I passed by before leaving. She ran a small turnaround with me and was so sweet. Clouds had begun to roll in by then and I verbalized, “Thank you, Lord, for the clouds! !” I told her I was so grateful for the cloud cover and she agreed it was a blessing, because it was still a warmer day than it had been in a while. Mile 9 brought me to the main road next to the high school where the start/finish was. I could hear music and that’s when I started thinking, “I’m really running my second half marathon! !” My family had popped up a couple times with signs to cheer me on and they were there on the edge of the field encouraging me once again. As I ran on the main road and left the comfort of a neighborhood I was familiar with I began to feel strong. I was running a long distance. I may be slow, but I had begun passing people who looked fit and much more in shape than I. I was going to make it. Oh, and soon after I realized there was a hill. Not a large hill, but after nine miles of running and in a city that has hardly any hills, I had hit a small hill and it felt larger than it was. I’m making it! You guys are the best to show up! My family showed up right before the third and last aid station, a total surprise to me and I was so pleased to see they had driven over to be there. Aww…. I slowed to a walk while I took a swig of gatorade and then got back to running knowing I was getting close to the finish. When I saw the “Mile 11” marker I was like WOO HOO!!!! only two more miles left!!! My Garmin had died just before mile 10, so I had no idea about how much was left. I knew the neighborhood, so I could guess, but they had some twists and turns and I couldn’t remember exactly how the map had looked. I passed a young man between miles 10-11 and told him he can’t let an old lady pass him. He replied he was having bad hip pain, so I tossed over my shoulder, “There will always be another race, but you don’t have another body. You take care of yourself. 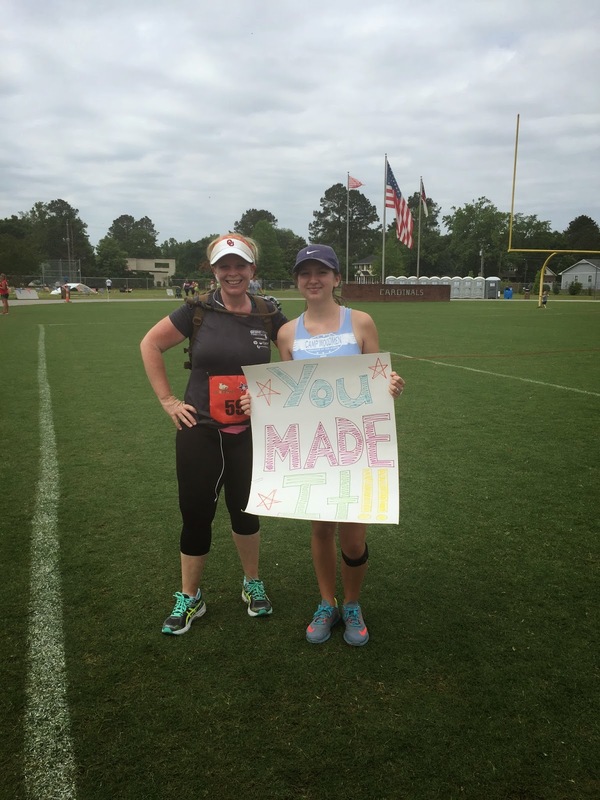 ” He nodded a defeated nod…and then passed me after mile 12. Good for him. I sure hope he is feeling better today. Right before mile 12 I caught up with a young woman who ended up running that last mile with me. By this point we didn’t talk much, but she said she couldn’t wait to eat. Apparently she hadn’t eaten anything during the run and it sounded like she hadn’t eaten breakfast either. Oh my. My last mile running partner. Not much talking by this point. I had eaten my energy chews every 45 minutes and took swigs of my Nuun in my camelback as needed. I wanted to reprimand her for not fueling properly, but decided there was no point since we were already done. I hope she learns and doesn’t do that to herself again. Poor girl. This year the finish line of this race was about 2/3 – 3/4 around the track. This is my only complaint. When I got to the football field the last thing I wanted to do was keep running almost a full lap to finish. Sigh. The past three years the finish has been just as you entered the track. It was a great finish!! My husband wanted to hug me as soon as I crossed, but I had to walk for a minute or two. I asked him to put my Nuun No Limits Finisher medal on me, because he knew what stress I had pushed through to finish this training and race. My daughter was kind enough to capture it on film. 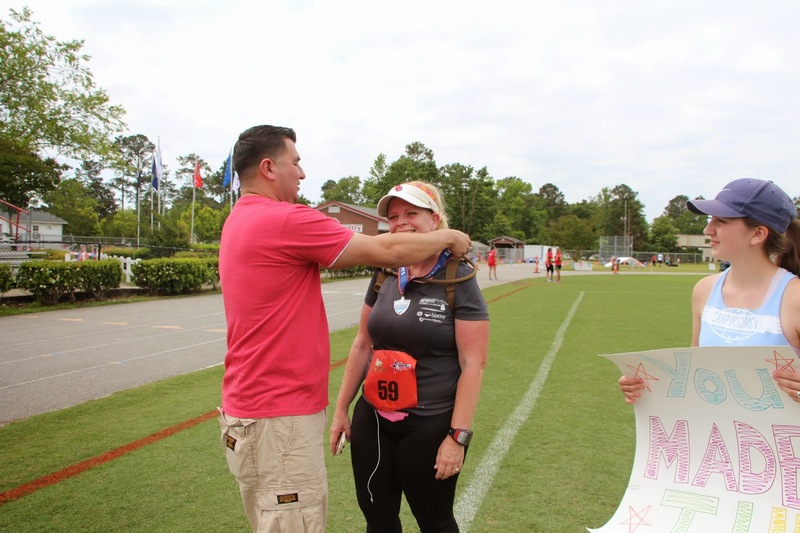 Getting my No Limits medal that only means so much to me. Special sign I saw coming across the finish line. And my daughter who finished her 10K in pain most of the time. We took some pictures and then I finally stretched before heading out to eat with my family. It’s kind of become a tradition to go for breakfast after a race. I wasn’t really that hungry, but I knew I needed to eat. In fact, I don’t think I quit smiling all day. I’m so glad I chose to do this race and even more glad I didn’t quit. It was worth every single workout, tear, joy and pain to cross that finish line strong. What a fantastic story! Congratulations on your success Leah! I love the support from your family and friends. It is all very inspiring. Wonderful post. Congrats on making it through so well under what sounds like stressful circumstances. And, so cool, the support you had at the race. Congrats on 1/2 Marathon #2!!!! Having that support is so important!